X-10 Concentrate is a heavy-duty, refined, coal-tar-based pavement sealer designed to protect asphalt pavement against the harmful effects of sunlight, water and oil spills. X-10 Concentrate will enhance the appearance of your asphalt pavement and is ideal for parking lots, taxiways, playgrounds and driveways. 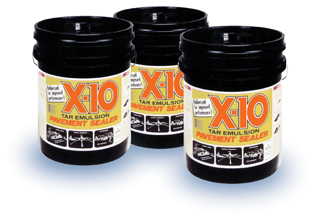 X-10 Concentrate is a contractor-grade pavement sealer designed to be the foundation for each contractors' mix design. When diluted with water by volume, X-10 Concentrate should cover 50-100 square feet per gallon under normal conditions. X-10 Concentrate is designed to be diluted with water Ð a minimum of 25% by volume under normal conditions. X-10 Concentrate contains a select grade of refined coal tar pitch that undergoes strict processing control to develop an exclusive mix design. Keep this product from freezing. Air temperature 24 hours preceding and after application should be at least 50°F (10°C) and rising. Do not apply if rain is predicted. Temperature and humidity will affect drying time. Do not apply over pavement that has been sealed with oil-based sealers or asphalt surfaces less than 90 days old. Two coats are recommended, but one coat may be sufficient. Read SDS and safety warnings before use. Contact Extendit's sales staff to find out more about other useful pavement maintenance products at1-800-245-0005.